When simplicity is key for your bedroom decor, our Lynnwood Suite is the perfect set to incorporate. 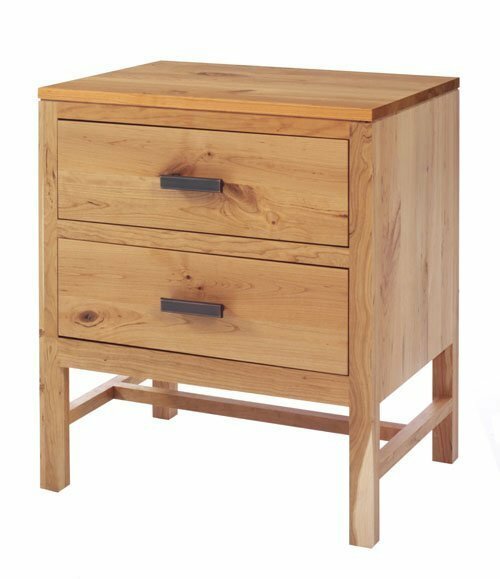 Crafted with a contemporary feel that is influenced by classic Shaker designs, our Lynnwood Nightstand is a stunning example of a simplistic, functional piece, perfect for your bedside! The flush mounted drawer fronts serve to display the exacting perfection achieved in each piece and provide a clean, uniform look that allows inclusion into any decor. Placed next to your bedside, your new Lynnwood nightstands offer two full-extension drawers that will hold all your nighttime necessities and give you easy access when you need it. Add the undermounted slides for a tasteful, "floating" drawer look that features a soft-close mechanism that ensures your drawers close quietly and completely, each and every time. As with all pieces in the Miller Collection, you choose the wood, stain and hardware that best suits your unique decor and we will start building the bedroom of your dreams. If you have any questions, please call one of our Amish Furniture Specialists today to answer your questions and start your order by phone. Toll-Free (866) 272-6773.